Incidents such as territorial disputes and nationalist protests are but symptoms of deeper undercurrents at work in deteriorating Sino-Japanese relations. The Sino-Japanese relationship serves as a cornerstone of peace and stability in the Asia-Pacific. While the relationship took a positive turn after the normalization of relations in 1972, it has in recent memory deteriorated under the weight of geopolitical tensions, coupled with rising anti-Japanese nationalist sentiments in China. While it is tempting to list the episodes of tensions as factors, incidents such as territorial disputes and nationalist protests are but symptoms of deeper undercurrents at work. This essay has identified three such factors. First, the increased sensitivity of Chinese leaders towards nationalist sentiments, given the implications towards the political legitimacy of the Chinese Communist Party (CCP), coupled with the emergence of a new generation of leaders adopting more uncompromising positions. Second, the changing strategic and economic realities of the relationship. Following the loss of a common strategic objective in containing the Soviet Union in 1990, China's assertiveness and willingness to utilize military means to attain national objectives became a concern for Japan. These consternations were further heightened in the economic realm where economic interdependence between both countries are increasingly eroded by elements of competition, leading to the overall deterioration in the relationship. Third, the distribution of military capabilities has increasingly shifted in China's favor over Japan, and has enabled greater assertiveness by China in securing its territorial waters. With its offensive-defensive balance altered, Japan seems to have moved towards a more concerted balancing strategy, building up its defence capabilities, strengthening its alliances with the US, whilst removing constitutional constraints on its armed forces. In totality, the changes in economic and military balance, coupled with the quest for domestic legitimacy by Chinese leaders amidst rising nationalist sentiment has placed Sino-Japanese relations in a precarious position. In the midst of heightened tensions, more efforts have to be adopted by both sides to manage the relationship and avoid unnecessary escalations. The first factor to be considered is the propensity for political leaders in China and Japan to take heed of the rising tide of domestic nationalist sentiments in their approach towards Sino-Japanese bilateral relations. One way to ascertain the determinant variables is a comparison of two sets of anti-Japanese furor in 1985 and 2005, both of which were triggered by visits to the Yasakuni shrine by a sitting Japanese Prime Minister (PM) and revision of history textbooks that redacted Japan's wartime role. Nevertheless, both incidents had very different outcomes. In 1985, leaders from both countries sort to reduce tensions. Chinese leaders clamped down on protestors, whilst Japanese leaders were more accommodative of Chinese sensibilities, with then PM Nakasone ordering a review of Japanese textbooks and avoiding further visits to Yasakuni. Comparatively in 2005, Japanese leaders seem less willing to accommodate Chinese sensitivities, with then PM Koizumi refusing to renounce his visits. Moreover, in 2005 Chinese leaders seem more willing to allow the protest to foment, and less willing to crackdown on patriotic groups. There are two possible causal variables to account for the changes in outcomes and attitudes of leaders. First, the increased sensitivity towards nationalist sentiments and its impact towards the political legitimacy of the CCP. The Chinese government since the 1989 Tiananmen incident has become a lot more sensitive towards the impact of nationalist sentiments towards its political legitimacy. Scholars such as Susan Shirk have linked the widespread clampdown of the 1985 protests with the subsequent protests over political rights and free speech that culminated in the Tiananmen incident. In its aftermath, the Chinese leadership implemented a Patriotic Education Campaign that served to imbue younger generation of Chinese with a strong sense of history education that included the evocation of strong anti-Japanese sentiment. This includes emphasizing the historical atrocities perpetuated by the Japanese against China during the Second World War, and the lack of remorse shown by Japan. Such a device further illuminates the successful triumph and resistance against the Japanese, of which the CCP's domestic credibility is built upon. There remains a debate within academia as to whether Chinese leaders were deliberately stoking nationalist sentiments as part of its"international strategy" of messaging to the world, as compared to the notion that Chinese leaders are reactive to nationalist sentiments and face challenges controlling it. The debate seem unresolvable and futile given the lack of evidence to falsify either perspectives. Nevertheless, regardless of the source of anti-Japanese sentiments, it is clear that Chinese leaders have to manage the possibility that anti-Japanese sentiments could invariably turn against the establishment. An example of which is online statements chastising the Chinese government for letting China"suffer a great humiliation" following a collision between a Chinese commercial vessel and a Japanese Coastguard vessel in 2010. As stated by Fewsmith, patriotism in China serves as a"two-edged sword", with adherents showing support for the government's action, yet also setting a standard that is impossible for the government to attain. Such concerns writ large in the face of Chinese President Xi Jinping's ambition to realize the"Chinese nation's great renaissance" and to attain the"China Dream" during his term in office. Hence, Chinese leaders have to engage in a delicate balance between their own domestic legitimacy that is couched in patriotic terms, against maintaining cordial relations with Japan, and preserving the necessary policy space in the realm of foreign affairs to act in the interest of the state. Such a dilemma could also explain the motivations of Chinese leaders in the management of anti-Japanese protest in 2005, where authorities were content with adopting the patriotic mantle, and allowing nationwide protests to play out, before intervening to prevent the protests from escalating further. With the torrent of anti-Japanese sentiments emanating from China, Japanese have held increasingly negative views towards Chinese demands towards historical issues, as"excessively and disturbingly hostile" towards Japan. In reaction to the 2005 protests in China, a smaller protest took place demanding an end to"anti-Japanese education" in Tokyo. In a survey conducted by the Japanese government, 40 per cent of respondents said that they do not feel an affinity towards China in 2004, with that number rising to 83 per cent in 2014. Hence, the display of anti-Japanese sentiment comes at a cost to people-to-people relations, and further diminishes the possibility for political leaders to push towards positive relations given the lack of impetus from their constituents. Second, the presence of a different generation of leaders in both China and Japan also serves as a factor. Political leaders were faced with a different political environment in 2005 as compared to 1985, and did not possess the same nationalist credentials and interest for positive bilateral relations as their predecessors. In 1985, Deng Xiaoping wanted to maintain positive relations with Japan given reliance on Japanese investments and aid in galvanizing China's economic liberalization efforts. Deng as with other second-generation leaders also possessed greater nationalist credentials compared to his successors, and thus was more confident in curtailing popular sentiment. Contrastingly, the fourth generation leadership under Hu Jintao and Wen Jiabao who had barely cemented their authority, had to balance between the strong nationalist sentiments inherited from their predecessors, whilst preventing such sentiments from generating domestic problems and worsening relations with Japan. In Japan, the left-wing faction was still dominant within the Liberal Democratic Party in the 1980s, and were more accommodative towards Chinese sensitivities. Nevertheless, since the late 1990s a new slate of conservative leaders with few personal connections with China took power in Japan, and adopted more hardline and uncompromising positions towards China. To surmise, the deterioration in the relations between China and Japan could be partially attested to the increased sensitivity of Chinese leaders towards nationalist sentiments in the aftermath of the Tiananmen incident, given its potential impact on the political legitimacy of the CCP leadership. The changing approach towards historical issues between China and Japan could also be attested to the generational change in leadership in both countries, where a new generation of leaders in both countries do not possess the same nationalist credentials and interest for positive bilateral relations as their predecessors. The second factor to be considered is the changing strategic and economic realities and its implications towards the Sino-Japanese relationship. There are three sub-factors to consider. First, the fall of the Soviet Union removed a common strategic objective for both China and Japan. During the Cold War, there was certainty amongst Japanese policymakers that anti-Japanese historical issues were secondary to economic interdependence, as well as a common objective to contain the Soviet Union. Such objectives bore importance for China's leadership as the quest for economic development, partially assisted by Japan, was seen as central to the stability and security of the CCP. Hence, patriotic expressions against Japan were clamped down efficiently. Moreover, Japanese leaders were confident it possessed influence over the relationship through economic cooperation via the dispersal of Official Development Assistance (ODA) and as the largest source of Foreign Direct Investment (FDI) in China during the 1980s. This is also in keeping with the neoliberal institutionalist ideal of generating mutual benefit out of cooperation in the drive towards absolute rather than relative gains. Nevertheless, the common strategic imperative of containing the Soviet Union diminished with the latter's dissolution in 1990. In its wake, Japan became concerned with the increasing assertiveness and willingness of China to utilize military force to attain its national objectives, conducting nuclear tests in 1995, and military exercises in the Taiwan Straits in 1996 in the run up to the Presidential Elections in Taiwan. Despite both countries sharing strong economic linkages, concerns arose over whether China's intentions were not necessarily peaceful. Second, along with increasing tensions over historical issues in 2005, there are indicators that the economic relationship between China and Japan -- the one area which both sides shared common interests -- could be diminishing. The concerns were based on the Japanese economy's reliance on China's growth to climb out of recession in 2003-2004, coupled with China overtaking Japan as the world's second largest economy in 2010. Moreover, while the share of exports and imports between China and Japan has remained constant over the past decade, Japan's FDI in China has decreased from $13.5 billion in 2012 to $6.7 billion in 2015, with its investments diversified towards newly industrialized economies in Asia, and outstripping China for the first time in 2014. With the diminishment of economic interdependence between China and Japan amidst rising nationalist tensions, there could be fewer avenues for Tokyo to influence Beijing, and fewer disincentives for political leaders towards restrain during periods of contention. Third, the increasing presence of competition in the relationship and utilization of economic measures to attain political objectives. In recent times, the Chinese economy has sought to move beyond low-end towards high-end manufacturing, in areas which would place it in direct competition with Tokyo. China has also sought to expand its investments beyond resource investment towards capital investments and other services with outbound investments growing by 50 per cent in 2015. This places China in direct competition with Japan. Both countries have since competed for railway infrastructure projects in Indonesia and India, as well as the establishment of alternative institutions such as the Asian Infrastructure and Investment Bank (AIIB), which mirrors the functions of the Japanese-led Asian Development Bank (ADB). Additionally, Beijing has also shown no qualms in utilizing economic measures as political punitive tools, such as the ban on rare-earth exports to Japan following the arrest of a Chinese commercial captain over clashes near the Senkakus/Diaoyu islands in 2010. With the collapse of the Soviet Union, the Sino-Japan bilateral relationship lost a common strategic objective that had bounded both sides towards a common purpose. Moreover, China's increased assertiveness and its willingness to utilize military means to attain its national objectives was a cause of concern for Japan. Such concerns are further heightened in the economic realm, where the shared economic interdependence between both countries is gradually diminishing, and eroded by elements of competition. The third factor to be considered are the structural changes in the balance of military capabilities between both countries that have set the tone for the tension-riven relationship. Such a balance is based upon two theories of international relations. First, Neorealism postulates that given the ordering principle for the international system is anarchy, where there is no supreme authority, all units such as states thus share the same functional characteristics, with the only differentiating structural variable being the distribution of capabilities between states. Second, defensive realism argues that states are more focused on security rather than power maximization, and hence states tend to behave more defensively rather than offensively. States will assess the threat posed by a potential adversary through a series of factors including its intentions, capabilities and geography. One such important factor is the offensive-defensive balance -- which is the combination of factors that determine the challenge of consequent. There are two key points on the state of relations between China and Japan that could be gleaned from both theories. First, the distribution of capabilities could potentially shift in China's favor, with its rising military capabilities potentially one of the causes for bilateral tensions between both countries. China has attained the accolade as the world's second largest economy, ahead of Japan in 2010. More importantly, it has shown the capability to convert its economic power towards military power, increasing its defence budget by nearly fivefold over the past decade in tandem with GDP growth. Contrastingly, Japan continues to see its economy in stagnation. Its defence budget nevertheless stands at $41.4 billion which represents a 1.5 percent increase from the previous year after the stagnation of its defence budget for over two decades, but still five times smaller than China's budget. Such an imbalance stands in contrast to the turn of the century where the relationship was inverse, and where the Chinese defence budget stood at $43 billion as compared to Japan's $46 billion. Moreover, the military expenditure advantage for China has translated to qualitative and quantitative advancements in weaponry acquisitions, with its military modernization focused on air and naval forces, ballistic missile development, as well as cyber and space capabilities. While analyst have dismissed the likelihood of China challenging the US' military supremacy, it has been noted that China's advances could increase the cost for any US intervention into a crisis in the Asia-Pacific Region. Japan who relies heavily on the US military presence for its security, and having seen its military expenditure vastly overtaken by China, has voiced concerns over China's military modernization. In 2002, then Japanese Defence Agency Chief Nakathani Gen characterized the trajectory of China's military budget"as a major threat and a problem", reflecting concerns in Japan over a widening military capabilities gap. Second, the implications of the shifting capabilities gap and offensive-defensive balance have shaped tensions between China and Japan. China's efforts at building both militarily defensive and power-projection capabilities could restrict and deter US military presence around the vicinity of its territorial waters, whilst also securing its territorial claims in the ECS such as the Senkakus/Diaoyu Islands. Neorealists argue that China as the emergent power will attempt to balance against the unipole and challenge the present concentration of power. As a result, Japan who is allied with the US will increasingly"feel a new proximity" to the frontlines as China seems to have moved towards a more comprehensive balancing strategy. Over the past decade, Japan has upgraded its defence and power-projection capabilities. Moreover, the Japanese government has made strides towards easing the post-war restrictions on the Japanese Self-Defence Force (JSDF) through the enactment of a new security law in 2015 that allows the JSDF to act in"collective self-defence". Such measures also augments Japan's alliance with the US, which will expand JSDF support to the US-Japan alliance to include a wider range of areas. The measures have raised concerns in China, with an op-ed from the state-run Xinhua News Agency chastising the reforms as a"dark strain" for Japan, reflecting the concern that Japan could increase its military power to commensurate with its economic power in spite of its troubling history of militarization. Hence, the distribution of military capabilities has increasingly shifted in China's favor over Japan, and serve as a factor in the deteriorating relations between both countries. With advancements in its military capabilities in terms of defensive and power-projection capabilities, China's assertive efforts to restrict and deter US military presence around the vicinity of its territorial waters, whilst securing its territorial claims in the ECS has altered the offensive-defensive balance for Japan as prescribed by defensive realist. Hence, Japan seems to have gradually moved towards a more concerted balancing strategy by building up its defence capabilities, strengthening its alliance with the US, whilst removing constitutional constraints on its armed forces. Such moves have conversely invited consternation from China, fearing the expansion of a Japanese military that commensurate with its economic power, and in light of the tragic history of Japanese militarization. The changes in the economic and military balance, coupled with the quest for domestic legitimacy by the Chinese leadership amidst rising nationalist sentiment places the Sino-Japanese relationship in a precarious state. China equipped with strong structural advantages coupled with the need of its leaders to fortify their domestic legitimacy, has adopted an uncompromising stance towards its territorial disputes over the Senkakus/Diaoyu, confidently utilizing military and civilian assets to stake its claim. In August 2016, China reportedly dispatched 15 government vessels accompanied by 300 fishing vessels near the Senkakus/Diaoyu, the largest deployment on record. Japan on the hand having internally built up its defence capabilities, strengthened its alliance with the US, whilst removing"post-war constraints" on its armed forces seem to be moving towards a more concerted balancing strategy against China. In a recent meeting between Chinese President Xi Jinping and Japanese PM Shinzo Abe in September 2016, Xi called for the need to return relations onto a"normal track", whilst Abe committed towards working with China to forge friendly ties by"managing difficult issues". Beyond the pleasantries is a underlying tacit recognition by both sides that relations are not normal, and have to be"managed" to prevent unnecessary escalation. The terminology used in the study of security dilemmas comprised of the dilemma of interpretation, where decision makers are faced with two undesirable choices pertaining to the military or political postures of other entities, and the dilemma of response. The dilemma of interpretation has been settled and decision makers have to decide on their course of action. In the case of Sino-Japan relations, it is apparent that both China and Japan have resolved both their dilemma of interpretation with each viewing the other's intentions as malignant, and their respective dilemma of response as well, with a decision to assertively enforce their respective territorial claims. As postulated under the security dilemma, this could lead to a spiral of hostility, a state of mutually reinforcing escalations which neither side wants and goes against their respective interests. While the structural pressures faced by decision makers are difficult to transcend given the enormity and depth of the factors in question, minute steps such as the installation of communicative mechanisms such as bilateral hotlines and a code of conduct could mitigate against the risk of miscalculation and misperception. Bajapee, Chietigj. "Japan and China: The Geo-Economic Dimension." The Diplomat. Last modified on March 28, 2016. http://thediplomat.com/2016/03/japan-and-china-the-geo-economic-dimension/. Booth, Ken. and Wheeler, Nicholas J. The Security Dilemma: Fear, Cooperation and Trust in World Politics. New York: Palgrave Macmillan, 2008. Burchill, Scott. "Liberalism" in Theories of International Relations, ed. Andrew Linklater, 57-87. New York: Palgrave Macmillan 2013. "China Wants Relations With Japan On a"Normal Track", Xi tells Abe." The Japan Times, Last modified on Sep 5, 2016. http://www.japantimes.co.jp/news/2016/09/05/national/politics-diplomacy/abe-use-first-talks-year-urge-xi-ease-tensions/#.V-3iOpN968o. Christensen, Thomas J. The China Choice: Shaping the Choices of a Rising Power. New York: W.W Norton & Company, 2015. Elman, Colin and Jensen, Michael. "Realisms" in Security Studies: An Introduction, 2nd edition, ed. Paul D. Williams, 15-31. London: Routledge, 2013. Fewsmith, Joseph. "The Challenges of Stability and Legitimacy" in China in the Era of Xi Jinping: Domestic and Foreign Policy Challenges, ed. Robert S. Ross and Jo Inge Bekkevold, 92-116. Washington DC: Georgetown University Press, 2016. Fewsmith, Joseph. "Xi Jinping's Fast Start" China Leadership Monitor, no. 41(2013) 1-7. Ford, Matt. "Japan Curtails its Pacifist Stance." The Atlantic. Last modified on September 19, 2015. http://www.theatlantic.com/international/archive/2015/09/japan-pacifism-article-nine/406318/. Gries, Peter Hays. Steiger, Derek and Wang, Tao. 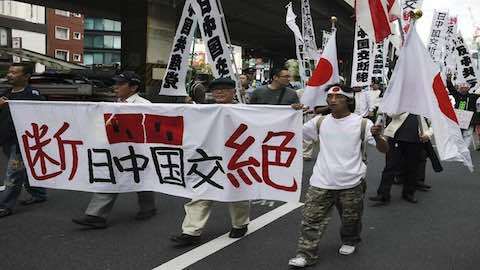 "Popular Nationalism and China's Japan Policy: The Diaoyu Islands Protests, 2012-2013." Journal of Contemporary China 25:98 (2015): 264-276. Heginbothan, Eric and Chase, Michael S. "China's Military Modernization: Eric Heginbotham and Michael S. Chase in Conversation." The Rand Blog. Last Modified on September 15, 2016. http://www.rand.org/blog/2015/09/chinas-military-modernization-eric-heginbotham-and.html. Hook, Glenn D. Gilson, Jule. Hughes, Christopher W. and Dobson, Hugo. Japan's International Relations: Politics, Economics and Security. 3rd ed., New York: Routledge, 2012. Hughes, Christopher W. "Japan's 'Resentful Realism' and Balancing China's Rise." The Chinese Journal of International Politics (2016): 109-150. "Japan protests after swarm of 230 Chinese vessels enters waters near Senkakus." The Japan Times. Last modified on Aug 6, 2016. http://www.japantimes.co.jp/news/2016/08/06/national/japan-ramps-protests-china-fishing-coast-guard-ships-enter-senkaku-waters/#.V-3g7pN968p. Mochizuki, Mike M."Japan's Shifting Strategy Towards the Rise of China." Journal of Strategic Studies 30: 4-5 (2007): 739-776. "Passage of New Security Bills a Dark Stain For Japan." Xinhua News Agency. Last modified on July 16, 2015. http://news.xinhuanet.com/english/2015-07/16/c_134418901.htm. Roy, Denny. "The Source and Limits of Sino-Japanese Tensions." Survival 47:2 (2006): 191-214. Shirk, Susan L. China: Fragile Superpower. Oxford: Oxford University Press, 2008. Smith, Paul J. "China-Japan Relations and the Future of Geopolitics in Asia." Asian Affairs: An American Review 35:4 (2010): 230-256. Stockholm Institute of Peace Research Institute (SIPRI). Military Expenditure by Country 2006-2015. Last modified in 2016. https://www.sipri.org/sites/default/files/Milex-constant-USD.pdf. Waltz, Kenneth N."Intimations of Multipolarity." The New World Order. ed. Birthe Hansen and Bertel Heurlin, 1-17. New York: St Martin's Press, 2000. Waltz, Kenneth N. Theory of International Politics. Reading: Addison-Wesley Publishing Company, 1979. Weiss, Jessica Chen. "Authoritarian Signaling, Mass Audiences, and Nationalist Protests in China." International Organization 67(1), (2013): 1-35. "What does China Really Spend on its Military?". China Power: Unpacking the Complexity of China's Rise, Centre For Strategic and International Studies (CSIS). Accessed on 15 September 2016. http://chinapower.csis.org/military-spending/. Susan L. Shirk, China: Fragile Superpower (Oxford: Oxford University Press, 2008), 161. Joseph Fewsmith,"The Challenges of Stability and Legitimacy" in China in the Era of Xi Jinping: Domestic and Foreign Policy Challenges, ed. Robert S. Ross and Jo Inge Bekkevold (Washington DC: Georgetown University Press, 2016), 101. Jessica Chen Weiss,"Authoritarian Signaling, Mass Audiences, and Nationalist Protests in China," International Organization 67(1), (2013): 26-27. Quoted in Peter Hays Gries, Derek Steiger and Tao Wang,"Popular Nationalism and China's Japan Policy: The Diaoyu Islands Protests, 2012-2013," Journal of Contemporary China 25:98(2015), 267. Denny Roy,"The Source and Limits of Sino-Japanese Tensions," Survival 47:2 (2006): 202. Peter Hays Gries,"Popular Nationalism and China's Japan Policy: The Diaoyu Islands Protests," 270. Joseph Fewsmith,"The Challenges of Stability and Legitimacy," 106. Joseph Fewsmith,"Xi Jinping's Fast Start," China Leadership Monitor, no. 41(2013): 3. Denny Roy,"The Source and Limits of Sino-Japanese Tensions," 205. Paul J. Smith,"China-Japan Relations and the Future of Geopolitics in Asia," Asian Affairs: An American Review 35:4 (2010): 236.
z08.html. quoted in Christopher W. Hughes,"Japan's 'Resentful Realism' and Balancing China's Rise," The Chinese Journal of International Politics (2016): 134. Glenn D. Hook, Jule Gilson, Christopher W. Hughes and Hugo Dobson, Japan's International Relations: Politics, Economics and Security, 3rd ed (New York: Routledge, 2012), 177. Ibid., 144. Shirk argues that Chinese politicians utilize anti-Japanese sentiment to position themselves as strong leaders or to externalize domestic problems. Hence, the less secure the leader, the more the individual will fan anti-Japanese sentiments. Mike M. Mochizuki,"Japan's Shifting Strategy Towards the Rise of China," Journal of Strategic Studies 30: 4-5 (2007): 747. Between 1979 and 2005, more than $28 billion were dispersed in ODA transfer payments to China. Scott Burchill,"Liberalism" in Theories of International Relations, ed. Andrew Linklater (New York: Palgrave Macmillan 2013), 68. Kenneth N. Waltz, Theory of International Politics (Reading: Addison-Wesley Publishing Company, 1979), 107. Colin Elman and Michael Jensen,"Realisms" in Security Studies: An Introduction, 2nd edition, ed. Paul D. Williams (London: Routledge, 2013), 21. Colin Elman and Michael Jensen, 21. Stockholm Institute of Peace Research Institute (SIPRI), Military Expenditure by Country 2006-2015, (2016), distributed by SIPRI, https://www.sipri.org/sites/default/files/Milex-constant-USD.pdf quoted in"What does China Really Spend on its Military? ", China Power: Unpacking the Complexity of China's Rise, Centre For Strategic and International Studies (CSIS), accessed on 15 September 2016, http://chinapower.csis.org/military-spending/. Stockholm Institute of Peace Research Institute (SIPRI), Military Expenditure by Country 2006-2015, (2016), distributed by SIPRI, https://www.sipri.org/sites/default/files/Milex-constant-USD.pdf. Thomas J. Christensen, The China Choice: Shaping the Choices of a Rising Power (New York: W.W Norton & Company, 2015), 81. "Increase in China's Military Budget Is Threat -- Japan Defense Chief," BBC Monitoring International Reports, May 28, 2002 quoted in Paul J. Smith,"China-Japan Relations and the Future of Geopolitics in Asia," 241. Kenneth N. Waltz,"Intimations of Multipolarity", The New World Order, ed. Birthe Hansen and Bertel Heurlin (New York: St Martin's Press, 2000), 2. Ibid., 144. The procurement of 42 F-35s capable of offensive strike missions, and upgrade of anti-missile defence systems capable of countering Chinese missiles strikes targeting Taiwan, which has drove Chinese concern that such measures could wither its deterrence. Matt Ford,"Japan Curtails its Pacifist Stance", The Atlantic, September 19, 2015 http://www.theatlantic.com/international/archive/2015/09/japan-pacifism-article-nine/406318/, accessed on 15 September 2016. "Passage of New Security Bills a Dark Stain For Japan," Xinhua News Agency, July 16, 2015 http://news.xinhuanet.com/english/2015-07/16/c_134418901.htm, accessed on 15 September 2016. "Japan protests after swarm of 230 Chinese vessels enters waters near Senkakus," The Japan Times, Aug 6, 2016 http://www.japantimes.co.jp/news/2016/08/06/national/japan-ramps-protests-china-fishing-coast-guard-ships-enter-senkaku-waters/#.V-3g7pN968p, accessed on 15 September 2016. "China Wants Relations With Japan On a"Normal Track", Xi tells Abe," The Japan Times, Sep 5, 2016 http://www.japantimes.co.jp/news/2016/09/05/national/politics-diplomacy/abe-use-first-talks-year-urge-xi-ease-tensions/#.V-3iOpN968o, accessed on 15 September 2016. Ken Booth and Nicholas J Wheeler, The Security Dilemma: Fear, Cooperation and Trust in World Politics" (New York: Palgrave Macmillan, 2008), 4-5. "Factors Behind Deteriorating Sino-Japanese Relations"